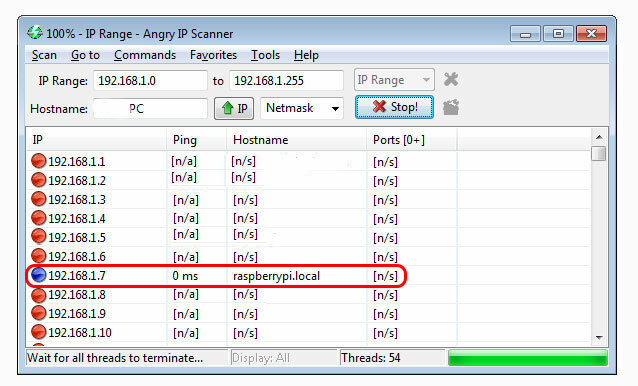 In this tutorial, we shall be using network scanner to identify Raspberry Pis ip address using nmap and angry ip scanner and assign Raspberry Pi a fixed address. If you have configured your Raspberry Pi obtain ip address from DHCP server and would like it to have a static IP address, this tutorial is for you. If you are having console access (directly attaching keyboard and screen) to your Raspberry Pi you can skip this step. Once the Pi is up and running we shall need to discover the IP address from the local network. We can do that easily by running a network scan over the local network. Install the IPscanner tool and follow these steps. From the IP scanning window it will automatically select the local network range, for scanning. In case it does not you may need to enter is manually. My local network is 192.168.1.0/24, which gives me the ip address range of 192.168.1.0 to 192.168.1.255, which is on my ip address range. Once you start scanning, you shall see a similar input with one hostname raspberrypi.local with the ip address 192.168.1.7 see the following image. The nmap command (Network Mapper) is an open-source network discovery tool, available for Linux, Mac OS, and Windows. To install on Linux Debian or ubuntu or Raspbian, install the nmap package e.g. apt-get install nmap. To install on Mac OS or Windows, see the nmap.org download page. Now you have the IP address of your computer, you will scan the whole subnet for other devices. For example, if your IP address is 192.168.1.5, other devices will be at addresses like 192.168.1.2, 192.168.1.3, 192.168.1.4, etc. The notation of this subnet range is 192.168.1.0/24 (this covers 192.168.1.0 to 192.168.1.255). Here you can see a device with hostname raspberrypi has IP address 192.168.1.7. If you can login to your router configuration page, you shall also find the ip address of the raspberry pi devices under the attached device section.